Adevcia is an oral hair loss treatment that is purported to stop the loss of tress strands and promote hair growth. Up to 40% of men and women will be facing hair loss issues at some point in their lives. While it is common to feel frustrated and helpless about your condition, you should not allow this to stop you from taking positive action to prevent future hair loss. Fortunately, there are many supplements and treatment systems on the market that are effective at treating hair loss and enhancing hair growth. In many cases, hair loss can be stopped in its tracks, and lost hair can even be re-grown with the right treatment and a little perseverance! Since nutritional deficiencies can play a key role in hair loss, nutritional supplementation is a proven way to halt hair loss and improve the health of the scalp and hair. Advecia is an all-natural hair growth supplement that is perfect for those who are seeking an effective alternative to prescription medications. Shampoos and creams for hair loss can be messy, so supplements have been created to combat hair loss from the inside. 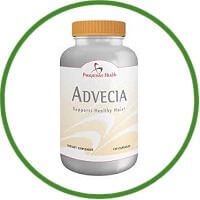 Advecia is a supplement produced by Progressive Health Nutraceuticals Inc. Advecia is designed to stop hair loss and promote new hair growth by using vitamins, minerals, and herbs. Hair loss is caused by the production of DHT. DHT is a hormone that damages hair follicles and decreases their rate of growth. Unlike other formulas Advecia was created to stimulate these damaged follicles for re-growth. Hair loss can be the result of heredity, stress, lack of nutrients, and outside factors. Advecia reports studies that prove that hair loss is partially caused by lack of nutrients to the scalp. Advecia’s goal is to provide these nutrients for benefits unlike any other product. As a non-prescription hair loss solution, Advecia can be used by both men and women. Conducted studies show sixty-three percent of growth in men and women as well as no further hair loss in fifteen percent. Less than a quarter of those tested did not have any results. Advecia uses the science of RNA to improve hair by promoting thicker and stronger hair. By eliminating clogged hair follicles, Advecia also dissolves dead skin cells and reduces build up and scalp oils that lead lessened growth. RNA is stimulated to work with DNA processes in delivering nutrients to damaged hair follicles. Blood flow can then be stimulated to the scalp and damaging hormones are reversed. Studies have shown that better nutrients and diet leads to better hair growth, the idea behind Advecia supplements. Advecia ingredients include saw palmetto berries, green tea extract, and grape seed extract. Reports say that Advecia has the ability to actually promote hair growth, though results may take several months to be seen. With the right science and research, it seems that Advecia got it right. It provides all of the minerals and nutrients that are essential for healthy scalp and hair. 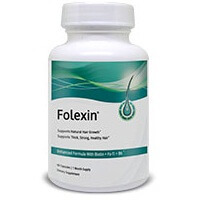 It assists to revive dormant hair follicles to promote re-growth. Ingredients help reduce inflammation and nourish the scalp. It is backed by more than 12 years of scientific research. Advecia works from the inside out by counteracting the damage done by hormonal changes as you grow older. It assists to neutralize the damage caused by DHT since excess DHT production is a large factor in causing hair loss in men. But, Advecia is not just for men, it can also be safely taken by women who are suffering from hair loss, since the Advecia supplement does not just address hormonal causes of hair loss, it also has a rich blend of nutrients that compensate for the effects of nutritional deficiencies and stress which is a leading factor in hair loss in both men and women. Advecia assists your body to dissolve dead skin cells, sebum and left over particles from shampoo and other hair care products which have the effect of clogging the hair follicles. This assists to renew the hair follicles so they are better able to receive the vital nutrients that they need for strong and healthy growth. Advecia includes ingredients to support rapid hair growth and it also helps to increase circulation in the scalp and to reduce inflammation. To put it simply, Advecia hair loss formula works by reducing the causes of hair loss and maximizing hair growth by combining unique nutrients such as natural herbs, amino acids and vitamins that are not contained in large amounts in the common diet. Saw Palmetto is commonly used as a remedy for treating prostate enlargement, and there have also been clinical studies showing good results when the extract is used to treat male pattern baldness. The extract of Saw Palmetto Berries is rich in phytosterols, a powerful fatty acid that is effective in inhibiting the production of DHT and therefore reducing male pattern baldness. Beta-sitosterol – is another fatty acid that is a potent DHT blocker and found in Saw Palmetto component. Green Tea is a common ingredient in hair loss products as it contains Polyphenols which are basically antioxidants like those found in red wine which studies have shown have an anti aging effect on the body and help to maintain good health. Green Tea extract also has an anti inflammatory effect which is helpful since the balding process is usually accompanied by inflammation of the scalp and follicles, so reducing the inflammation are vital in stopping the hair loss process. Proteins are the basic component of the cells and are essential for healthy hair growth. been no reports of serious side effects. Moreover, Advecia reviews suggest that the results are more permanent in nature as opposed to other hair solutions out there. The company also offers a generous and unconditional 180 days money back guarantee to users. The company has taken proactive measures to prevent scams. For instance, the product is not sold in stores or any other place except the company’s official site. With the right research and science, Advecia seems to be loaded with essential properties that is required to promote hair growth. However, results may take 2 to 5 months. So, this product is not meant for those who dream about overnight results. As a matter of fact, any natural solution out there may take few months to deliver positive results. Where To Buy Advecia Hair Loss Treatment? It has been observed that there are lots of websites out there that sell low quality imitations of the original product. As a user, it would be next to impossible to separate the junk from genuine products. Hence, it important to exercise caution while purchasing Advecia in order to stay free from scams. Since Advecia is an all-natural hair loss treatment there have been no reported negative side effects from using it. Naturally, you should always check the ingredient list if you have any allergies to herbs or vitamin products. Advecia contains fatty acids derived from natural sources which many people prefer to synthetic fatty acids which have some possible unwanted side effects. There were no reported side effects of using this brand. But, if you are already suffering from insomnia, using this might aggravate it further because it contains Green tea, which has caffeine properties. But the chances of having insomnia because of using this are pretty remote. It is completely safe to use Advecia in conjunction with other hair growth supplements or treatments, and for fast results you definitely should consider using a topical treatment in addition to your daily Advecia supplement. The best thing about Advecia is that is comes with a full 180 day money back guarantee, that’s a full six months! No other hair loss treatment product in the market offers such a long guarantee period which means the company is very confident that the product can produce results. Advecia has generous discount offers if you purchase a few months of supply at once. One container of Advecia has 30 servings or 120 tablets which last for one month. The dosage is four capsules daily, taken as two capsules in the morning and two in the evening. If you have a sensitive stomach taking the capsules with a meal is recommended. For best results, Advecia recommends taking the supplement daily for 45 – 60 days. If you have seen good results after taking the supplement for a few months you may not need to continue to take it every day, but can change to a maintenance dose of once a week, while monitoring your hair growth and health to find the maintenance dose that works for you. This oral hair loss treatment is manufactured by a company called Progressive Health which began its operation in 1997. This is a good company that produces health and wellness supplements and products. Adevcia is an oral hair loss treatment that is purported to stop the loss of tress strands and promote hair growth. This promise is actually not different with other brands. I am sure you have heard it all before. So what makes this product different? If you read the information that they have provided in their website, you can come to the conclusion that this is more of a dietary supplement than a treatment. It can also be considered as a treatment, though—an alternative treatment. It uses herbal ingredients that are known for their body rejuvenating, hair loss preventing properties. The ingredients used are pretty much reliable. If you have a bit of knowledge about herbal remedies, you will know that Green Tea, Saw Palmetto and Grape Seed Extract are remedies that can really provide immense benefits. Basing from this alone, we can have an inkling that it does work in some way. If we base it on some Advecia review and feedbacks, we will have an idea of how much this product works? You can find many testimonials that it does work in thickening the hair and promoting hair growth. The ingredients also improve the other functions of the body which is a definite plus. It prevents dryness and brittleness. It improves the lustre and shine of tress.